This week’s absurdity comes from the people at SYRCL, specifically their River Science Director that is coordinating the Environmental Assessment of TDLT’s plan to drain the lake and wetlands. We would refer you to her latest comments at the following link. It has been stated by some, that the “science” will decide the fate of Van Norden Lake. Unfortunately, as most working scientists know, scientific data can be inherently ambiguous and prone to multiple interpretations. 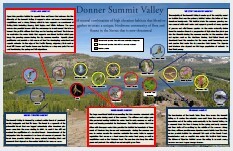 In this article we will take a look at some of this ambiguity as it applies to the Donner Summit Valley. While we recommend that you read the full article, we would like to address what we believe is the primary point of the article which is that Van Norden Lake has adverse effects on the Yuba River downstream of the dam. To support this assertion the article cites the “serial discontinuity” theory that states that impoundments of water in lakes within a river system will have significant effects on that system. The references are pretty technical and while Van Norden Lake doesn’t really fit into the strict tenets of this theory, I don’t think anyone would be surprised that there would be differences between lake and river habitats and they would affect each other. If you dive into the literature concerning lake and river systems you quickly realize that these fields of study are not always in agreement (see this paper supporting the advantages of the integration of lakes and rivers in a drainage system). Unfortunately, as with many complex ecological systems, there is not enough data to provide a definitive description of all the processes that are involved and their positive and negative effects. Fortunately, we don’t really have to be concerned about whose theory is correct or even, contrary to the SYRCL article, whether Van Norden Lake adversely affects the downstream Yuba. To understand why Van Norden Lake doesn’t really have profound effects on the Yuba downstream, let’s take a look at some of the data provided by none other than, SYRCL. 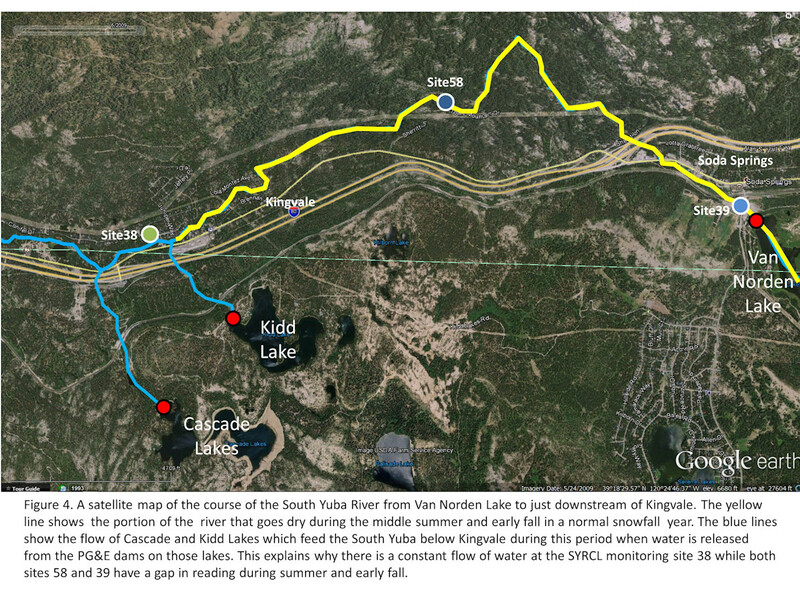 In their article, SYRCL included a pretty much unreadable graph that purportedly points to Van Norden Lake as the cause of a temperature elevation in the downstream Yuba. However, if you go to the actual raw data that they provide (kudos to whoever designed their interactive webpage) you can get a clearer picture of what is actually going on. 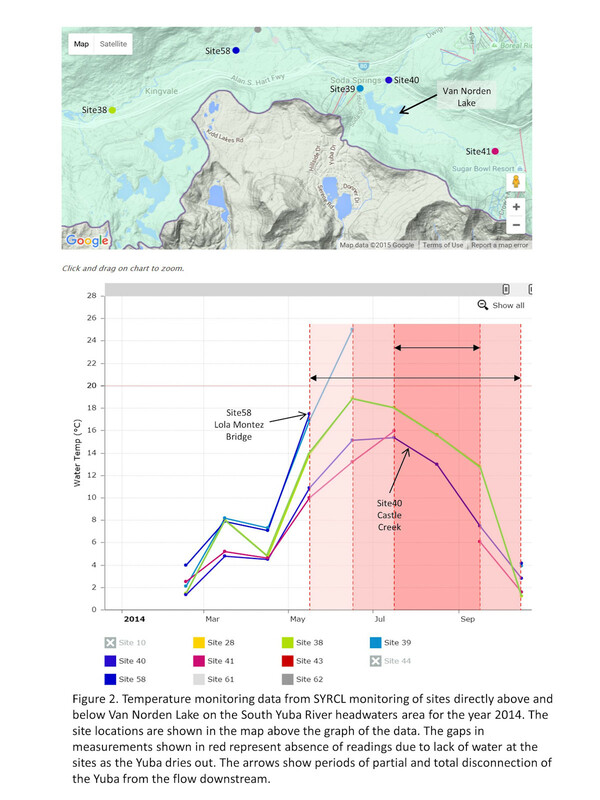 You can view the water temperature data in detail for 2014 in Figure 1. 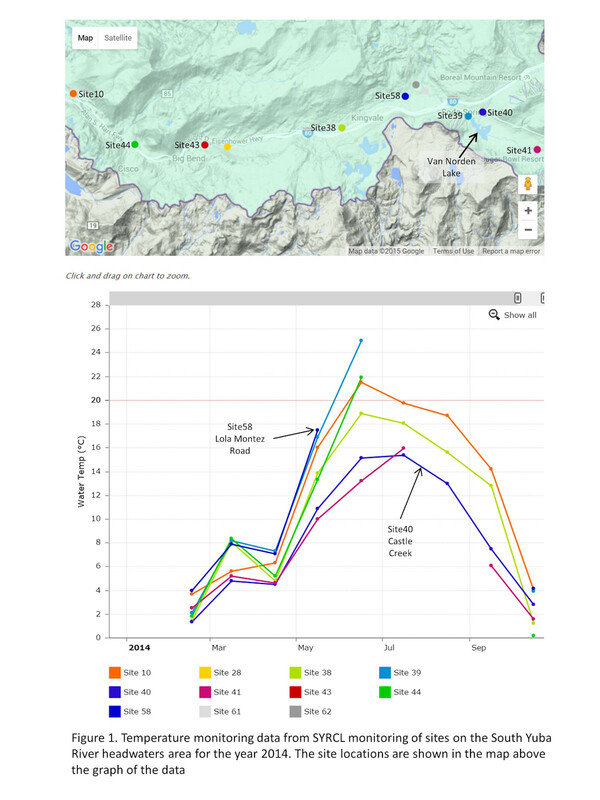 In order to understand this data it is important to know the locations of the monitoring stations which are shown on the map above the graph in Figure1 and the yearly seasonal cycle of Donner Summit Valley. The monitoring sites at Castle Creek (site 40) and the South Yuba headwaters (site41) are above the meadow and lake and sites 38, 39, 58 and are below the dam (Unfortunately, the colors for Sites 40 and 58 are very similar and those sites are identified on the maps). The yearly water cycle of the Donner Summit Valley is somewhat unique in that the area experiences some of the highest snowfall amounts in California with an average of 34 ft (see this link). As a result water is sequestered as snow from the months of November to April or May and the South Yuba, Castle Creek, and Van Norden Lake remain frozen during this period. In normal and dry years the flow down the Yuba is minimal during this period (unless there are heavy winter rains). It is not until the spring melt in April and May that the flow down the Yuba starts in earnest and as we will see by the data discussed below, that flow comes to an end in mid summer. 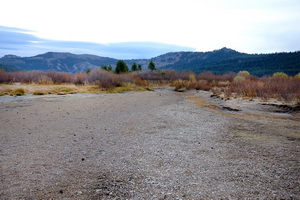 The reality is that other than the period from April to July, for much of the year the Donner Summit Valley and Van Norden Lake and Meadow are effectively disconnected from the flow of the downstream South Yuba and as a result have very little influence on it. As with most things in this world the devil is in the details, so let’s look a little closer at the data. 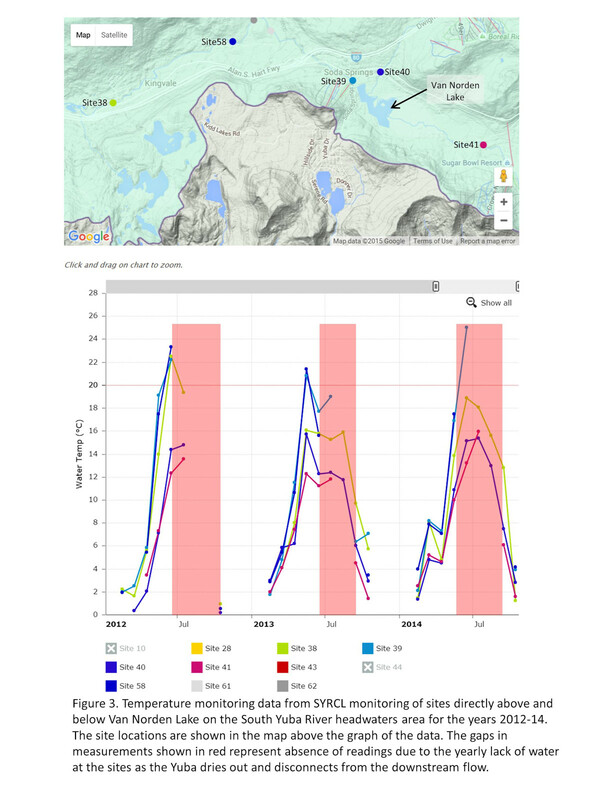 The same temperature data for 2014 is shown in Figure 2 for just the sites immediately upstream and downstream of the lake and meadow. The site at Kingvale is also included for reasons that will be explained below. As is often the case in science it is important to look at all aspects of the data. In order to understand that Van Norden Lake has very little influence on the downstream Yuba it is important to look at the frequencies of the temperature readings at the upstream and downstream sites instead of the values of the temperature readings. You will notice that there are not contiguous readings for Sites 58, 39 and 41 during the summer and early fall. The reason for these gaps is due to the fact that during these months there is no water flowing to take temperature readings. What this data shows is really the crux of the situation with the Yuba River in the Summit Valley. The fact is that vast majority of water drains out of the Summit Valley from April through June and there is not enough water coming out of the watershed during the summer and early fall to keep the River flowing past July. As a result, the Donner Summit Valley is disconnected from the downstream Yuba River during that period. As the data shows, the disconnect starts downstream at Site 58 in early summer and then moves up to the output of the dam in midsummer and is finally disconnected from the upper Yuba when it goes dry in late summer (see the August flyover video below). 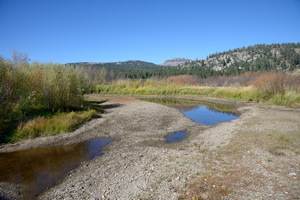 While the input from Castle Creek continues during the summer, it is at such a low flow that it is dissipated when it enters the meadow and is not enough to supply the Yuba. 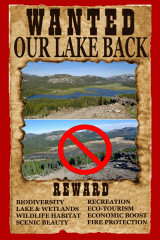 The simple truth of the matter is, contrary to what has been stated by SYRCL, for most of the summer and early fall Van Norden Lake is disconnected from the downstream Yuba and really has no effect at all. And lest you think that this disconnection is due to the dam, keep in mind that the 180 acre-ft of water that is in the current lake is less than a day of flow down the Yuba during the melt. This natural disconnection has always occurred in the Summit Valley except in the heavier snowfall years. It is part of the reason that the valley probably never supported a fish population. The yearly occurrence of this phenomenon is shown in Figure 3 which shows data for the last 3 years showing that each year the Yuba disconnects during the summer months. It is SYRCL’s claim that Van Norden Lake adversely affects the downstream Yuba River by raising the temperature above 20° C. Their own data show that this in fact cannot really happen because the Yuba realy goes dry below Van Norden Lake (see our flyover of the Yuba below). You may be saying to yourself right now, wait a minute, what about site 38 just below Kingvale which shows continuous flow all year? This is where things get really interesting. If water is not coming down the Yuba above Kingvale, how is it that there can be a nice cool supply of water running all year from Kingvale down to Cisco and beyond. The answer to that riddle is shown in Figure 4. It turns out that there are three small lakes, Kidd and Upper and Lower Cascade, up on the ridge south of Kingvale that have PG&E dams on them. During the summer months water is released from these lakes and it flows down into the Yuba just below Kingvale and provides the water to keep the Yuba alive from Kingvale on. The real irony is that when Van Norden Lake was operated as a full 5800 acre-ft lake, cool water was released from the bottom of the lake every year to keep a continuous flow of the Yuba all year. You really have to scratch your head and wonder how the SYRCL Science Director can claim that they are concerned about keeping the river connected when the only time the river was truly connected was when there was much more “cement” involved. It is unfortunate that SYRCL cannot let go of its overpowering anti-dam bias to see that in fact the only reason that there is a flowing upper Yuba River for a good part of the year is due to strategically placed dams. We should point out another misconception that is being fostered by SYRCL and TDLT concerning their proposed plan for breaching Van Norden dam. The Science Director claims that the plan will “reconnect” the Yuba flowing in the Summit Valley. This is incorrect. The announced plan by TDLT calls for a breach of the dam to lower it 5 ft. While lowering the dam to this level will effectively drain the lake and lower the water table in the valley by 5 ft, the spillway will remain and the Yuba in the Summit Valley will continue to disconnect from the downstream river every summer. The plan will do nothing to change the downstream flow (or no flow) of the Yuba. What it will do is remove the lake so that TDLT can sell the land to the US Forest Service for $2 million dollars. One of the tenets of the scientific method is to try to minimize bias in the collection and analysis of data. There is a real danger when science is done to further an agenda. The literature is littered with discredited work done to further a personal bias or agenda. The Donner Summit Valley and Van Norden Lake and Meadow are unique high elevation resources sitting at the headwaters of the South Yuba River. The unique combination of local weather and habitats requires that any analyses take those unique attributes into account. Applying principles and methods from different ecological environments can not only lead to invalid conclusions, but can also be detrimental. Van Norden Lake and its surrounding wetlands are the result of some very unique influences, both natural and manmade. The result is a unique combination of habitats that foster increased biodiversity in the Summit Valley. 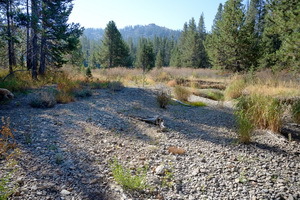 Considering the local contribution that these unique habitats make to the Donner Summit Valley and the fact that they do not really affect the downstream Yuba River, it seems only prudent to preserve them. We would expect that SYRCL and TDLT might respond to this article with a claim that their future “meadow restoration” plan will magically provide more water to the valley. In our next installment we will discuss some of the fallacies and misconceptions of what meadow restoration can really do in the Donner Summit Valley. The following flyover is from Google Earth in August of 2012. It shows how the Yuba goes dry in summer down to Kingvale. The Yuba stays dry until the rains come in the fall and it is covered by snow in the winter.